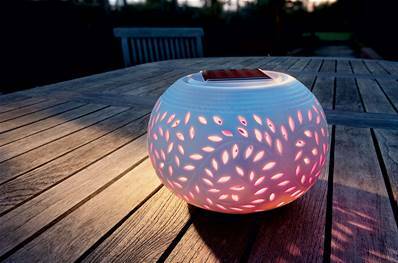 This solar table light makes an attractive central feature on a table and has the added advantage of offering light as the evening draws in. Made from white porcelain, the globe features a colour changing LED, which changes from Red, Yellow, Blue, Green, Pink and Orange automatically. This solar light is easy to use and requires no mains wiring. During the day, the energy from the sun recharges the battery in this solar light, which automatically turns on at dusk and off at dawn. Solar powered filigree design table light. Charge and light straight out of the box. An elegant table centre-piece for outdoor entertaining and dining. Two lighting options: Colour Change or Plain White. Great for your own use or to give as a gift.